The Israeli national mission to land a spacecraft on the Moon is underway — the spacecraft, "Beresheet", is to launch to the Moon on February 22, at 2045 hours, east coast time. Beresheet’s journey will last about two months until the scheduled landing on April 11, 2019. Once launched, the spacecraft will start a long and complex orbit. The SpaceX Falcon 9 rocket carrying the spacecraft will launch from Cape Canaveral. About 32 minutes after liftoff, the spacecraft will separate from the launcher. A few minutes after this critical point, assuming all occurs as planned, preliminary indications are expected to be received from the spacecraft to the control room located in Yehud, Israel. A few minutes later, the spacecraft's landing legs will open and a series of tests will then be initiated of all the spacecraft's systems to ensure they have successfully survived the launch and are working well in space. Artistic rendition of Beresheet having landed on the Moon. First, the launch is fraught with all manner of risks. Second, locating the spacecraft and contacting it over the vast distance to the Moon is quite intricate. Third, the spacecraft's durability under extreme conditions in space, complex navigation (without a GPS) etc. Fourth, the Moon Capture Point, where the spacecraft must switch from Earth's orbits to orbit the Moon and to perform this switch the spacecraft must reach the correct location at the correct time and at the correct speed and direction in order for a crucial braking maneuver that will enable the Moon's gravitation to capture the spacecraft. The final challenge is the most difficult — the actual landing on the Moon. The spacecraft will orbit the Earth in elliptical orbits and will travel 6.5 million kilometers, the longest distance ever traveled to the Moon. During these orbits, the spacecraft will raise its orbit around Earth until it reaches the proximity of the Moon. When the spacecraft is in lunar orbit, about 10 days before landing, it will orbit until the appropriate time and an autonomous landing process will start — the route will require about two months of time until the expected landing on April 11, 2019. The entrepreneurs Yariv Bash, Kfir Damari and Yehonatan Weintraub enrolled in the Google Lunar XPRIZE Challenge. The competition ended without a winner in March of 2018. However, SpaceIL, announced that it would continue working on the mission. The Beresheet development team. Photo is courtesy of SpaceIL. Since the establishment of SpaceIL, the task of landing an Israeli spacecraft on the Moon has become a national project, but funded by donors, headed by Morris Kahn. This is the lowest-budget spacecraft to ever undertake such a mission. The nations who managed to land a spacecraft on the Moon have spent hundreds of millions of dollars in government funding. The development and construction of the spacecraft with such a limited budget is a significant achievement in itself, both for the State of Israel and for the space industry worldwide. If the mission proves successful, it will be a technological breakthrough of an international scale. The significance of the project for the State of Israel landing a spacecraft on the Moon will bring an extraordinary achievement to the small State of Israel. The project expresses Israel's technological capabilities and opens many opportunities for it: First of all, it will promote scientific education of the next generation: since its foundation, the NGO met with more than one million students throughout the country. Second, it will advance and promote science and research. Third, this would open a new horizon for the Israeli economy, thanks to its engineering knowledge and advanced development capabilities. The success of Beresheet is a symbol of Israel's' success in these and other fields. The planning and development process of the spacecraft included intensive work by dozens of engineers, scientists and staff. The development by SpaceIL and IAI started in 2015 and lasted until 2018. The spacecraft, which weighs only 600 kilograms, is considered the smallest to land on the Moon. The height of "Beresheet" is 1.5 meters and the spacecraft is about two meters wide and carries fuel that is approximately 75 percent of its weight. Its maximum speed will reach 10 km. per second (36,000 km / h). Once landed on the Moon, the spacecraft carrying the Israeli flag will begin taking photographs of the landing site and a selfie to prove that "Beresheet" landed on the Moon. 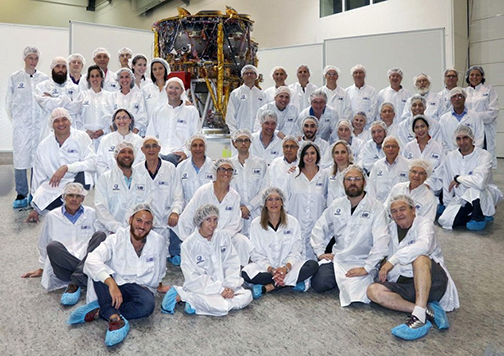 The spacecraft has an important scientific mission to complete: measure the Moon's magnetic field as part of an experiment carried out in collaboration with the Weizmann Institute. NASA is also participating in the mission under an agreement entered with Israel Space Agency. NASA has installed a laser retroreflector on the spacecraft, and will assist in communicating the spacecraft on the Moon. The spacecraft carries a "time capsule" — a huge database of hundreds of digital files ranging from details about the NGO, the spacecraft and the crew of the project, national symbols, cultural items and materials collected from the general public over the years to be placed on the Moon by the spacecraft. The time capsule will remain on the Moon after the mission is completed. As the spacecraft is not expected to return to Earth, the information it carries is destined to remain on the Moon for an indefinite period, and may be found and distributed by future generations. In January of 2019, the spacecraft was packed and flown to the U.S. launch site in a complex logistics operation and was flown in a unique container that underwent structural and engineering changes to accommodate the sensitive cargo. After arriving at Ben-Gurion Airport, it was loaded onto a temperature-controlled cargo plane. Upon landing in Orlando, Florida, USA, the spacecraft was transported by land to the launch site in Florida. Partners and donors: IAI has been a full partner in the project since its inception. Over the years, additional partners have been added from the private sector, government and academia. The most prominent of them are the Weizmann Institute of Science, the Israeli Space Agency, the Ministry of Science and Technology, Bezeq and others. Among the main contributors to the project are Miri and Sheldon Adelson, Sammy Sagol, Lynn Schusterman, Sylvan Adams, Stephen Grand and others. Philanthropist and businessman Morris Kahn took the lead in completing the mission in funding $40 million of the project and in his role as president of SpaceIL. Mr. Morris Kahn, President of SpaceIL, said that eight years ago, the company ventured on this journey that is now nearing completion in about two months when a Moon landing should occur. History is being made and the company is proud to be part of a group that dreamed and realized the vision that many countries in the world share, but so far only three have realized. The "Beresheet" project was presented as a gift to the President of Israel, where it was declared a national project. The company couldn't be prouder than to give this gift to the people of Israel and make it part of the Israeli ethos of technology, daring and a generous dose of nerve. Ido Antebi, CEO of the SpaceIL NGO, added that this journey to the Moon is full of challenges, which makes the firm's task extremely complex. Every step taken successfully outlines the way to the next successful one until the landing on the Moon. For many months, the company's teams and IAI's were engaged in testing the spacecraft and its systems, conducting complex experiments and preparing for every possible scenario of the mission, whose success will make Israel an extremely proud nation. Nimrod Sheffer, CEO, Israel Aerospace Industries, stated that the cooperation with SpaceIL is an example of the amazing achievements that can be attained by the State of Israel and a symbol for the path Israel has walked since its establishment. Most importantly, it illustrates the loftier achievements that can still be achieved — the know-how, the capabilities and the human capital are all here. 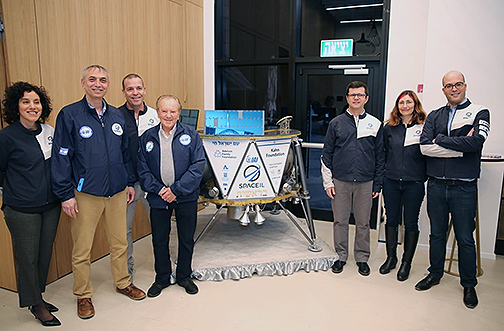 The journey to the Moon is fraught with challenges, but thanks to the professionalism, determination and faith of all the partners in the project, an Israeli spacecraft will be launched to the Moon in the coming days. IAI together with the company's partners at SpaceIL will continue to do everything necessary to ensure the success of this mission.